Editor’s Note: On the eve of Yom Ha’atzmaut — Israel Independence Day — Jews throughout the world mark Yom Hazikaron — Israel’s Memorial Day — to remember the soldiers who gave their lives. Israel needed heroes like these to win its independence and facing existential threats around it, Israel continues to need heroes like these to safeguard its independence. 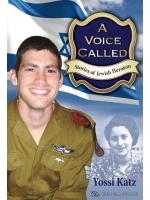 I just read A Voice Called: Stories of Jewish Heroism by Yossi Katz. I heartily recommend this collection of articles about some of the great Jewish heroes of modern times. The stories are written to shed light on Jewish history and to inspire the reader to live in the present with pride and dignity and to help build a better future. Michael Levin grew up like most American-Jewish kids. Born on February 17, 1984 and raised in Philadelphia, he graduated from Council Rock High School in 2002. Michael’s maternal grandparents were survivors of the Holocaust and passed on to him a legacy of pride and strength in his Jewish heritage. As a teenager Michael was active in the HaGesher Region of United Synagogue Youth (USY) and attended Camp Ramah in the Poconos. He loved sports and was an avid fan of Philly teams especially the Philadelphia Phillies. By ‘past’ I mean not only my own past, but the way in which I see myself as an inseparable part, a link in the chain of our existence and Israel’s independence. Like Yoni, Michael also saw himself as a link in the chain of Jewish history and felt an obligation to defend his people and dreamed of serving in the Israel Defense Forces. you loved so much that you’d be willing to sacrifice your life for it. For Michael — that ideal was Israel. that battle from one of the surviving veterans who spoke to his class. Now he was receiving his red beret on that hallowed ground. Michael described that day as one of the happiest in his life! country. Military service is tough enough for most young Israelis but they are comforted knowing they will come home on their Shabbat leaves to a warm and loving family. Michael had none in Israel, making his service that much tougher. to surprise his mom and dad and worked out a cute prank with his older sister, Elisa. When he arrived in Philadelphia that summer he had Elisa put a gigantic cardboard box with real Fed-Ex markings on the front steps of their home. Michael got into the box and had his sister tape it up and ring his parents’ doorbell. When Mrs. Levin saw the package, she tried to carry it into the house, but it was too heavy. Suddenly Michael jumped out of the box and screamed, “Surprise! !” This story is indicative of Michael’s loving heart and playful spirit. I heard a round of gunfire and saw Michael lying on his stomach. I knew in my heart he was dead. I lifted him to one of the houses where I tried to revive him, but there was no chance. I said quietly in English, “I love you Michael and I am so sorry.” He was wearing a big green kippah and before we went into Lebanon, I put his kippah on my head and said the Shema… praying that we all come back safely. After Michael was killed we placed his body on a stretcher and carried him for several kilometers between the cliffs and rocks to bring his body to safety. It was the final honor and respect that we could give him. prayer) for the ceremony, as they had no family in the country. They arrived at Ben Gurion Airport on August 3, 2006 and drove right from the airport to the National Military Cemetery on Mount Herzl. When the car arrived at the cemetery, the Levins saw thousands of people gathered there. Michael’s father was confused by the large crowd and thought there were 10 or 15 other funerals taking place at the same time. The soldiers escorting the family told them that Michael’s was the only funeral being held at this time and all the thousands of people in attendance, most of whom who had not known Michael, were there to honor their fallen son. Immersed in their shock and grief but embraced by a loving and grateful nation, the Levins buried their son on the hills of Jerusalem, the city he loved with all his heart… just a few yards from the grave of his hero — Yoni Netanyahu. Michael’s mother, Harriet, at first had wanted her fallen son buried near her home in Philadelphia but her Rabbi convinced her that it was Michael’s last wish to be buried in the land he loved. She said that when she and her husband, Mark, saw all the people who had come to honor Michael; they knew they had made the right decision. Harriet Levin said that if Michael had been buried in Philadelphia, probably only a handful of family would visit his grave but at rest at home in Israel, hundreds come every week to pay their respects to the young hero from Philly with the contagious smile and the heart of a lion. Postscript: Michael Levin’s mother, Harriet Levin, once told this author that Michael was a normal American-Jewish kid. She said he was just like you and me and added,” You know he wasn’t always an angel… at times he made mistakes and could get into trouble.” In many ways though, that makes Michael even more inspiring. He wasn’t a “Superhero”! He was just the kid from down the block, but when his people and Israel needed him- he was there! A moving documentary film by Sally Mitlas has been made about Michael Levin called A Hero in Heaven. For more information on the film go to www.aheroinheaven.com/.